It’s only February yet the men’s pole vault is taking off with Mach 5 velocity. 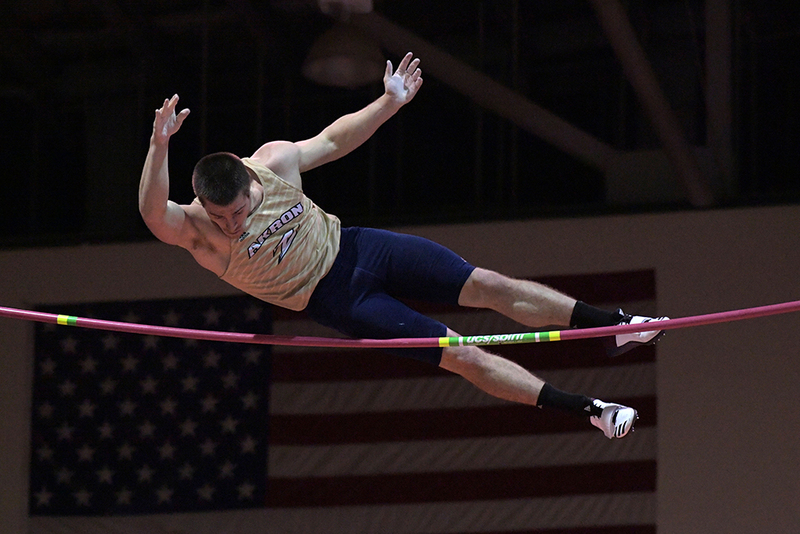 Collegians are in the elite mix as never before in the professional era and Akron senior Matt Ludwig, the first among NCAA athletes to touch the world lead this year, plans to fly with the best for all of what’s shaping up as a thrillingly competitive season. The ’17 NCAA outdoor champ in his first season with coach Dennis Mitchell’s Zips (he spent his frosh year at Missouri), Ludwig has broken out fast this winter. 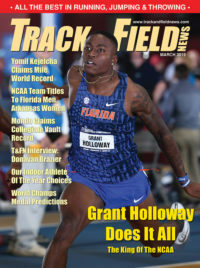 On January’s second weekend he equaled his PR of 18-8¾ (5.71) to win at the annual Pole Vault Summit, defeating some very high-hoppers, 6-meter men Mondo Duplantis and Shawn Barber, and 19-footers Andrew Irwin and Scott Houston among them. Reno was a meet of busting rust for most but Ludwig wasn’t just in for an early-season ambush. “Once you get over the Worlds standard [which his Reno height was exactly], at least on the men’s side that next box to check is 19-feet, up over 5.80,” he says. A week later at home, Ludwig checked it, soaring over 19-1½ (5.83) on second attempt for the world lead at the time to move to =No. 4 on the all-time collegiate indoor list (see box). “It’s funny enough, we did it at the Akron–Kent dual meet,” he says, “and it was run on ESPN3. In their coverage right after that jump, my teammates sort of swarmed me on the pit and we had this huge dogpile for 30 or 40 seconds. I think it was really just sort of a show that, even though it’s an individual event, it’s such a team sport and it was just as much of a victory and a success for the entire team as it was for me on that day. Each of my teammates knew just how hard that we worked together to accomplish our similar goals. I think seeing it pay off for someone like me with a big jump is really exciting for all of us and keeps us motivated to keep working hard every day.” Akron won the meet 78–72. Ludwig’s aim, and he’s well on his way, is to write his name among the trailblazers.